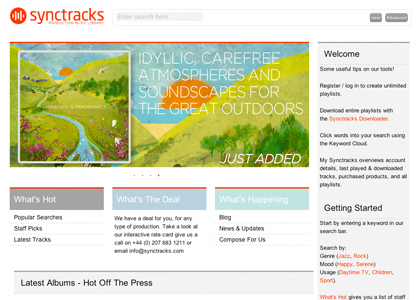 Requirements: Synctracks, a brand new music production library required a music search and distribution site with e-commerce to enabled them to launch their offering. Solution: Using Flex, we created a powerful admin site capable of handling the complex taxonomy of music keywording. In the public facing site our intelligent Wünderbar search facility allows users to search seamlessly across a wide range of meta-data without bewildering the user with options. Once the desired music is found it can be licenced, sorted, shared and downloaded.